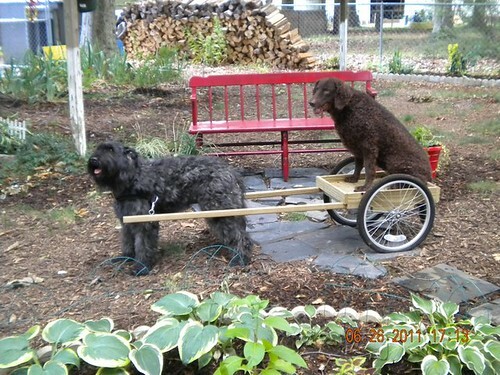 Almost any healthy and fit dog can cart, even if it is just a small wagon with a teddy bear for a passenger. You must gauge the weight placed on the dog appropriately. Your Curly should also be in good health, checked for congenital hip, elbow and shoulder problems, and be reasonably fit. 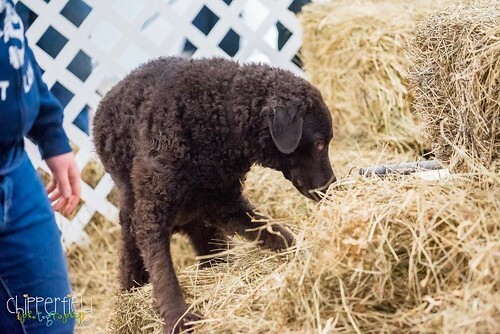 Carting/drafting/driving is a very physical activity, and your dog needs to be in good shape to take part. A dog is "tracking" when he is following the scent trail left by a human being (or other animal) that has passed along a certain route. Following a track is one of the many useful things dogs can do to help humans. 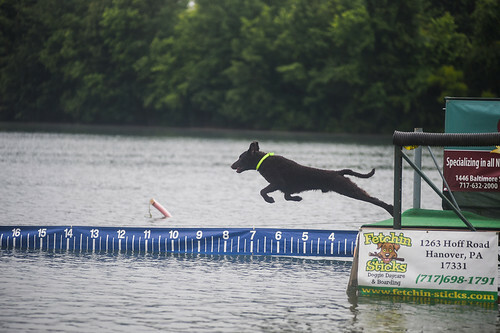 Hounds track game, rescue dogs track lost children, police dogs track suspects, well trained pets can find lost items. 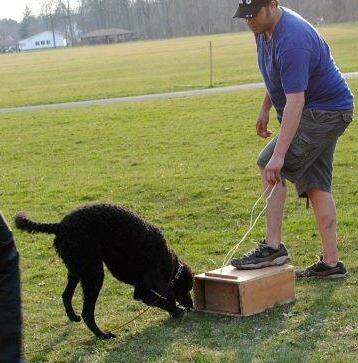 Many dog owners are involved in tracking with their dogs as a hobby (for fun) or as a sport (to earn titles), or both. 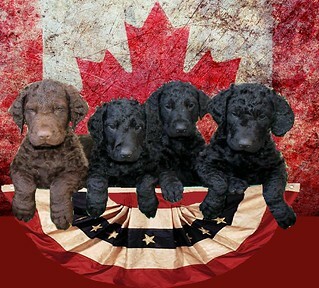 In the United States and Canada, tracking titles are offered by a variety of dog organizations. Search and rescue (SAR) dogs are motivated to locate human scent that moves around on air currents, and to follow that scent to its source - the victim. I use the word "motivated" because we don't train a dog to use its nose - it already knows how to do that - we just motivate the dog to use it, and to use it on command. SAR dogs are employed in a variety of emergency circumstances, such as, urban and wilderness settings to locate missing persons, in situations following a disaster such as earthquake or hurricane, and following avalanche or drowning incidents. 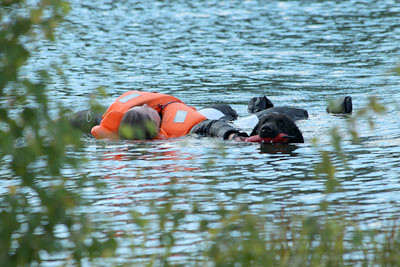 SAR dogs are also used for cadaver search and evidence search. Everyday the public is witness to the incredible scent detection skills of the police narcotics dog. In newspapers and magazines K-9s are praised for their super noses. 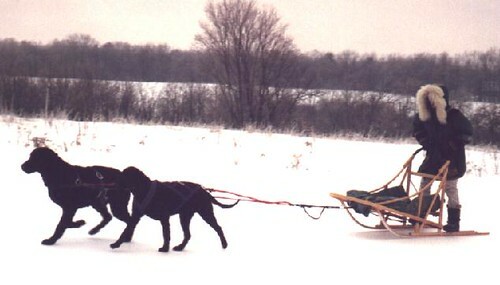 Skijoring is cross country skiing with one to three dogs tied to your waist. You wear a wide belt around your waist or hips and connect to the harness on your dog or dogs with a 3 to 4 meter long line that has a bungee cord built in to absorb the jerking. You ski, skating works best, while the dogs run along in front pulling on the line. If you don't have snow, it is a great way to go running with the safety of your dog accompanying you. You both get great exercise, have fun, and develop a strong bond.